Cleaning a Keurig coffee maker can seem quite daunting because of the smaller parts involved, but we’re here to help get you through it. In this guide, we will cover cleaning and descaling in depth. This will help keep your Keurig operating correctly and make sure it is free from mineral build up – so that it runs smoothly day after day. There are three major steps when cleaning any Keurig model, including removable parts, internal parts, and descaling. You probably already have the equipment needed, so let’s get started! Can I Put My Keurig Parts In The Dishwasher? If you’re machine isn’t running well despite cleaning, our Keurig troubleshooting guide might be able to help you diagnose and fix common problems. Brewer descaling is a process which removes mineral buildup, typically lime scale. You’ve probably seen it before – a hard, white substance that often builds up in coffee makers. Keurig recommends that you descale your brewer every 3-6 months. Tap water that contains high levels of minerals is known as ‘hard water.’ If your household water supply is hard water, mineral buildup can happen quite rapidly. Over time, this buildup can clog lines or break off in small pieces. This is often the reason why the water reservoir and feeding line fail to operate correctly in a Keurig brewer. Note: You don’t have to clean your Keurig before descaling. However, it is probably a good idea – it will help the descaling process and remove as much buildup as possible throughout the entire machine. Reassemble your Keurig as if you were ready to brew a fresh cup of coffee. Ensure that all pieces are seated properly. Don’t forget that water reservoir O-ring! Fill the water reservoir to about halfway with white vinegar. Dispose of the hot vinegar when the cycle completes. Continue brewing and discarding the vinegar until the reservoir is empty. Refill the reservoir with water. Brew hot water and discard until the reservoir is empty. This is to remove all the vinegar from the system, so you won’t get vinegar-flavored coffee. Now you’re ready to brew a fresh cup of coffee in your descaled Keurig! With this machine, you will need the Keurig maintenance accessory to perform a cleansing brew. If you didn’t receive one with your Keurig 2.0, you will have to purchase one separately or contact Keurig to see if they will ship one to you. You can purchase liquid descaling solutions for coffee machines. The main ingredient is usually citric acid, whereas white vinegar is about 3% acetic acid and 97% water. There are a variety of descaling solutions available on the market. 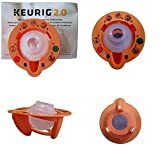 Keurig Descaling Solution is highly recommended, but some other brands can be quite harsh compared to vinegar, and ruin the internal workings of your coffee maker. If you plan on using a descaling solution, check the box for detailed directions. Make sure that any commercial descaling solution you purchase is safe to use in Keurig machines. The descaling process should be the same, but you would use the solution in place of vinegar. While we recommend using plain white vinegar, you may be curious about using the descaling solution offered by Keurig. There are a few things you need to know about it. The solution is citric acid based and it may leave a chemical taste in your Keurig – even after multiple cleansing brews. It may not be as effective as vinegar. It’s expensive compared to vinegar. If you feel the vinegar treatment isn’t working for you, you may want to give this a shot. Who knows, it just might fix a stubbornly clogged Keurig. Unplug the machine. Never clean or take apart your Keurig while it’s plugged in. Make sure you are working in a well-lit room that is free of clutter. Safety first! Remove the lid and water reservoir. You will notice the instructions under the lid as to how to clean the lid with a damp cloth. When removing the water reservoir, make sure you don’t misplace the O-ring, otherwise your Keurig will leak the next time you try to use it. Remove the k-cup holder and funnel. Be careful of the sharp needle(s) that puncture the Keurig cups. Remove the drip tray and drip tray cover if applicable. Unplug your Keurig before cleaning. Use a toothbrush or cue-tip to remove any coffee grounds in and around the K-Cup holder space. Using a paper clip, gently push inside the holes that pierce the K-Cup. These holes get clogged easily with coffee particles and built up minerals. You may have to wiggle the paper clip a little inside the holes. If a paper clip does not fit, search out something a little thinner. Note: The water line may get clogged at this point during the descaling process, so it’s important to be aware of it. If that happens, simply wiggle the paper clip inside, put the machine back together, and finish the descaling process. Don’t worry about breaking anything inside the holes, they are simply water lines with no working parts inside. You can also try turning the Keurig machine upside down and giving it a “gentle tap” on the bottom to help dislodge anything that may be stuck inside. Locate the water line spout and connect the straw to it. You may have to use your fingers to help make a seal. Use a microfiber cloth and all-purpose cleaner to clean the outside of the machine. We recommend spraying cleaner on to the cloth instead of directly onto the Keurig. This will help prevent the cleaner from getting into any unwanted areas. Alternatively, you can use soapy water to clean, and rinse using a damp cloth. Some areas may need a bit of elbow grease to get the stubborn grime off. Take your time and work on getting things as pristine as possible. Remove the water reservoir and empty it. Remove the water filter if your Keurig has one. Turn your tap onto full stream and allow the water to run over the mesh filter inside. This will help dislodge any debris. White scaling can appear, especially around the reservoir area. This can be cleaned using white vinegar. We recommend using a paper towel that is dampened with vinegar to wipe the area. You may have to soak the area and let the vinegar penetrate for a minute before wiping with a damp cloth and water. Again, a little elbow grease may be required until it all disappears. Most of these items are dishwasher safe, but we recommend adding the items (not the entire machine) to a sink full of warm soapy water and letting them soak for 10-15 minutes before rinsing and drying with a towel. Dishwashers can be harsh on plastic items. We get a lot of complaints about the plastic of the water reservoirs turning cloudy or warping. The culprit always seems to be dishwashers and hot water. You should never scrub the reservoir – a gentle wipe with a soft cloth will do. Don’t leave water sitting in your water reservoir for more than a week. Mineral deposits will build up as the water evaporates and you will need to spend more time cleaning and descaling next time you want to use it. Depending on a variety of factors, mold could also start to develop inside your coffee maker, which could make you sick. We wrote about this in our article​ Mold in Coffee Maker. As mentioned above, water straight from the tap can be “hard water,” containing high amounts of natural minerals. Not only can this affect your coffee machine, it can also affect the final taste of your coffee. Filtered water is purified and lacks minerals, meaning you’ll have to descale and clean much less often. Keurig recommends using filtered or bottled water to prevent excess mineral buildup and produce a better-quality brew. Some people argue that using filtered water takes away some of the subtle flavors they enjoy in their coffee – but this is a matter of personal taste. We recommend that you use a simple water filtration pitcher such as the Brita 10-cup Stream Filter, if your Keurig model doesn’t have one, to help remove unwanted chemicals and tastes from your tap water. This will give you better tasting coffee. The problem with sticky drinks is that sugar crystallizes and clogs the system, much like minerals do. Plus, you might invite unwanted pests if your Keurig is a sweet, sugary mess. The cleanup is compounded if you are using reusable K-Cups, since you will need to clean that unit as well. That’s all there is to cleaning your Keurig! After you have cleaned and descaled for the first time, the second time will feel easier and go much more smoothly. My Keurig is approximately 18 months old. I have cleaned it several times and descaled it according to directions. The water still does not pump through. I am very disappointed and definitely will not buy another one. Hi Juanita! That is disappointing for sure. Have you looked at our Keurig trouble shooting page (https://www.kitchensanity.com/coffee/common-keurig-coffee-maker-problems/)? There have been some success stories in the comments of people who have got their machines working again. There still may be some hope. Cheers! Juanita, I’m with you on this. I will NOT be buying another one. I still have my Cuisinart coffeemaker and will be going back to measuring my coffee grinds instead of K-cups for sure ! Not worth the money to be buying a $200/$250 every 12 months! Sorry Keurig! We’ve had our Keurig many years and have had success descaling with distilled white vinegar numerous times- until this last time. It had the sound of attempting to pump water from the resevoir with no success. I discovered a micro mesh filer in the bottom of the reservoir that was plugged. I was able to scrape the filer with a long handled flat bladed screwdriver. The Kuerig retuned to as new operation! Before clearing the filter I also noticed I could not see thru it when holding it up to the light. I’m convinced many Kuerigs have been replaced for this plugged filter! I have been having the same problems with mine too, I cleaned and descaled mine last night, and used it and it worked fine,then about 2 to 10 minutes later my husband went to make a cup of coffee and it would just barely pump water thru it? So i went and took it all apart and cleaned all the parts again then put it back together again and it started working again then it stopped working again so i said screw it so i went and got my phone and called customer service and told them what it was doing so they appoligised over and over again and got my info on the old one and told me that they would send me a brand new one to replace the one that was broken? Let me tell you it does get frustating after spending all the money that you spent on it! I tried everything to my old one and it still didnt fix the problem! I should have added that I have used filtered water since the beginning. Occasionally, we would use the gallon jugs of Deer Park water (typically when a new unit and then after descaling). BTW, we never had the light come on with the older models – just this new K550 2.0. I would descale the older models every 3 or 4 months using white vinegar. And we don’t drink any more coffee with the new 2.0 unit than the older units. When I filter my own water, I have a filter on the kitchen sink which allows me to select filtered or non-filtered water. I run the filtered water into a Brita pitcher and and filter again a couple of times (save those Deer Park empties for the job and pitch them when we buy the new jugs). Thank you for writing this article! My K-550 is about 4 months old (an upgrade from one of the first models) and has been brewing slowly the last few days. I was about to purchase the descaling solution from Keurig, but decided to do a little investigating before I bought it, I’m glad I did because it brought me here. Your article was very detailed, informative and easy to follow. I take my coffee drinking (enjoyment) very seriously (LOL) and if cleaning and descaling is going to preserve the life of my machine and ensure it keeps producing the coffee I enjoy, then I’m happy to make the commitment to clean/descale it thoroughly every three months. I do wonder about how much vinegar to purchase in order to fill the reservoir 2/3rds of the way. Thanks for the kind words Jennifer! While we recommend about 2/3 vinegar, if you haven’t neglected your Keurig for too long you could probably get away with using a lot less. Perhaps try 500ml of vinegar and top up with water to start. If you notice issues before the next 3 month period is up, try using more vinegar. I hate to be so dumb but when you say 2/3 vinegar are you saying 2/3 of a cup or 2/3 of the water reservoir. If it is 2/3 cup is that to a full reservoir of water or a smaller amount? The numbers really aren’t set in stone and it depends how long it’s been since you last descaled your Keurig. If you’ve never done it or it’s been months, 2/3 of the reservoir might be in order. I like to use a lot of vinegar. You could do 2/3 cup once a month as maintenance. Keep in mind that Keurig doesn’t support the use of vinegar and recommends their descaling solution. I have a one cup Keurig, which worked great for the first year or so. I use bottled water only and use only regular coffee k cups. Now for the last few months it has been making an extremely large hole in the top of the k cup, which allows some of the grounds to get in the brewed cup. I have cleaned per all instructions I can find and it hasn’t helped. long story short it still makes oversized hole(1/2″) in top of k cup. Love the videos – Thanks! I’ve been doing almost everything you showed but I didn’t know about the part that came apart. You just saved me from buying my third Keurig and I’ll be sure to tell the three people who got Keurigs as presents about that. BTW – we are on our third because we have upgraded, not due to any problems! One tip that I do & I have found HELPFUL – Canned/Spray air it gets every bit of coffee grounds! I do it first AND last because it gets any dislodged ground or loosened mineral deposit. Our current Keurig is 4 years old. With proper care I guess I’m going to have to wait awhile before I get to upgrade to a model that does a carafe, but if that was really important we wouldn’t have switched to get a fresh cup every time! We have a Keurig that is 1 1/2 yrs old that was sent to us as a replacement for our first Keurig that just died. We do routinely clean and descale it. The brewer starts out good but then it just bogs down and very little water comes out. Frustrating to say the least, this is our second and last Keurig. We have not found it to be a reliable product, seems like the newer models have the most issues. Friends have an older model and use it way more than we do, very rarely descale it and it works find. Why am I not able to watch the videos? It says “This is a personal video.” Otherwise I am finding the info very helpful-just wish that I could see the videos. With a 2.0 you can’t brew until the reservoir is empty. It makes you fill it up once you have about an inch left and won’t work if you don’t. If you’re adding water/vinegar solution, what do you suggest in order to get all of the vinegar out of the reservoir? If you don’t have a removable reservoir, and you’re strong enough, you could carefully turn the unit over in the sink. I think the best method is to do another run with a reservoir full of water. It should dilute the mixture enough to drink your coffee without any vinegar taste. Of course the best way to tell is to do a test cup of coffee. I am just buying my first Keurig. I saw a video somewhere that suggested pushing the K cup down when you insert it until it punctures at the bottom. This release the vacuum pressure. Then when you lower the top lid and the machine punctures the top of the K cup, there is n pressure to blow out bits of the coffee. You might try this and see if it helps.